The laws governing involuntary commitment in Washington State are lengthy and complex. Understanding the law requires 1) knowing a few basic definitions and 2) learning the legal process by which someone can be committed. This first article describes the process by which an individual can initially be taken into custody by the state and involuntarily committed. The basic definitions and legal process by which someone may be committed can be found in a document known as the Revised Code of Washington (RCW). (One definition of “code” is “a systematically arranged and comprehensive collection of laws.”) The RCW contains all the laws currently in force in Washington State. It is divided into large divisions called “titles” and, within each title, smaller chapters that are subdivided into sections. Title 71 contains the laws related to mental illness and Chapter 71.05 holds the laws that govern involuntary commitment. Likelihood of serious harm is defined as a substantial risk that the person will inflict harm upon themselves, or other people, or upon the property of other people, as evidenced by behavior that indicates this is likely to happen if there is no intervention. In most states this likelihood of serious harm, or “dangerousness,” as it is commonly described, must be imminent, meaning it must be likely to occur fairly soon. This is not true in Washington and psychiatric special interests continually try to weaken this element of involuntary commitment law. In some states likelihood of serious harm, or “dangerousness,” as it is commonly described, must be imminent, meaning it must be likely to occur fairly soon. This is not true in Washington and psychiatric special interests continually try to weaken this element of involuntary commitment law. Symptoms or behavior which standing alone would not justify civil commitment may support a finding of grave disability or likelihood of serious harm when: (a) Such symptoms or behavior are closely associated with symptoms or behavior which preceded and led to a past incident of involuntary hospitalization, severe deterioration, or one or more violent acts; (b) these symptoms or behavior represent a marked and concerning change in the baseline behavior of the respondent; and (c) without treatment, the continued deterioration of the respondent is probable. In making a determination of whether there is a likelihood of serious harm … the court shall give great weight to any evidence before the court regarding whether the person has: (a) A recent history of one or more violent acts; or (b) a recent history of one or more commitments under this chapter or its equivalent provisions under the laws of another state which were based on a likelihood of serious harm. The existence of prior violent acts or commitments under this chapter or its equivalent shall not be the sole basis for determining whether a person presents a likelihood of serious harm. For the purposes of this subsection “recent” refers to the period of time not exceeding three years prior to the current hearing. There are many problems with this section of the law, which we will discuss in more detail in parts two and three of this series. One point should be made now. Nearly all the long term studies of antipsychotics demonstrate that it is “treatment” with psychiatric drugs that ensures the “continued deterioration” of individuals in and out of the mental health system. Here we see an example of the distortion of the true meaning of words that can be found throughout Chapter 71.05 and that characterizes the language of totalitarian political systems. Treatment that takes place under the threat of state imprisonment can never be truly voluntary. Before filing the petition, the DMHP must personally interview the person, unless the person refuses. The petition is a legal request for a judge to issue an order to imprison the person in an “evaluation and treatment facility” for not more than 72 hours (not counting weekends and holidays). The use of the word treatment here is questionable. Psychiatric disorders, unlike typical medical diseases, are not defined according to any objective physical signs that can be measured via lab tests or radiology, or simply seen (swollen joint, broken bone). Moreover, psychiatrists acknowledge in their diagnostic manual that they cannot distinguish health from illness when it comes to their invented disorders. ** As a result, what psychiatrists do to patients – primarily prescribing powerful mind altering and body damaging drugs – takes place in the absence of any knowledge of what, if anything, is being treated. Treatment, as used here, is one of many words used by psychiatrists that serve primarily political (i.e. state governance and control of citizens), not medical, ends. At the end of the 72-hour hold, the court can order the person to be committed for “fourteen days additional involuntary intensive treatment or ninety additional days of a less restrictive alternative to involuntary intensive treatment.” Less restrictive treatment is mainly court ordered psychiatric drugging that takes place outside the confines of a mental hospital/prison. In our next article we’ll cover what happens after the 14-day period of commitment. Those who want to explore Washington State involuntary commitment laws can do so here. * It is important to remember that, although we use the phrase “mental illness” for the sake of simplicity, almost none of the conditions defined by psychiatrists as disorders have been proven to be illnesses. The concept is an invention designed to give the appearance of medical validity to psychiatry’s arbitrary and subjective labeling of individuals. Psychiatry’s fraudulent claim to medical legitimacy, in turn, forms the basis upon which it is granted power by the state. 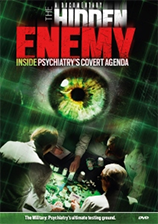 Psychiatry, as CCHR co-founder Thomas Szasz says in the CCHR documentary, Psychiatry: An Industry of Death, is “politics, pure and simple.” In other words, it has to do with the state exercising control over citizens.